Go to jobs.uhaul.com or uhaul.com/jobs to get the full picture of U-Haul careers page and make your decision of how to search a job from three ways - Enter job title or keyword and location and click Search Jobs, Use Quick Search at the left side of the page and select your preferred job areas and click IT Job Opportunities at the bottom if you're heading for a job in the IT field. Here we choose Corporate Jobs in the quick search section to continue with the application process. 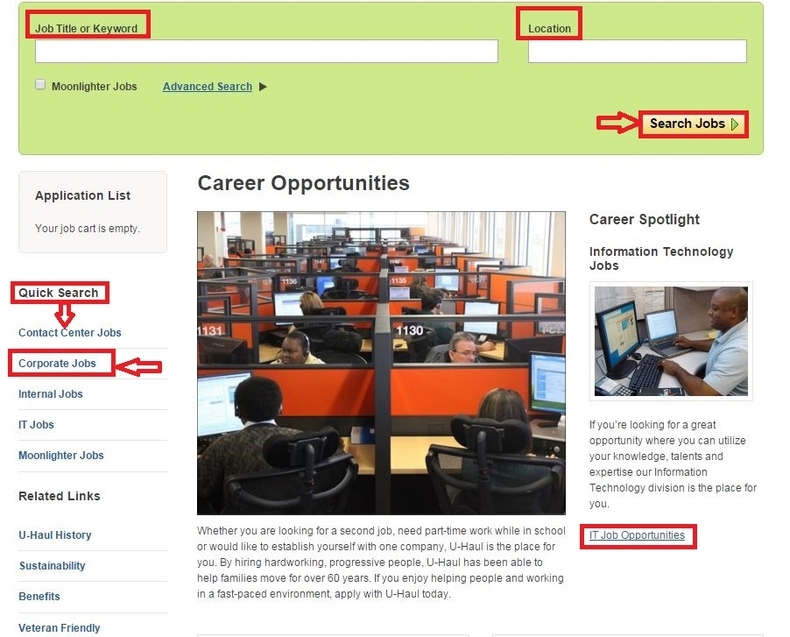 After you select corporate jobs in the last step, you're directed to the page shown below on which presents the four departments under corporate jobs from which you could select one area to quickly search for an ideal job or you can directly click the job title shown in the results. 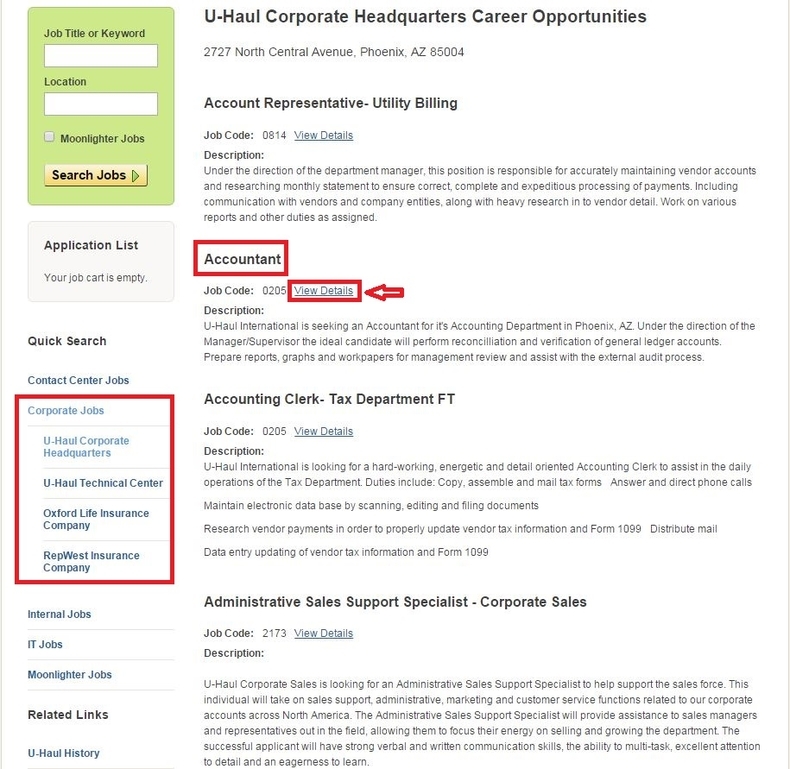 Here we choose "Account" as career path to go through the whole application process. Step 3 asks you to read the job details including job description, requirements and work status, after which you can click Apply for this job if you're 100% sure to take this job to achieve your career dream. Before you're shown the page below, you are firstly required to answer some pre-employment questions. 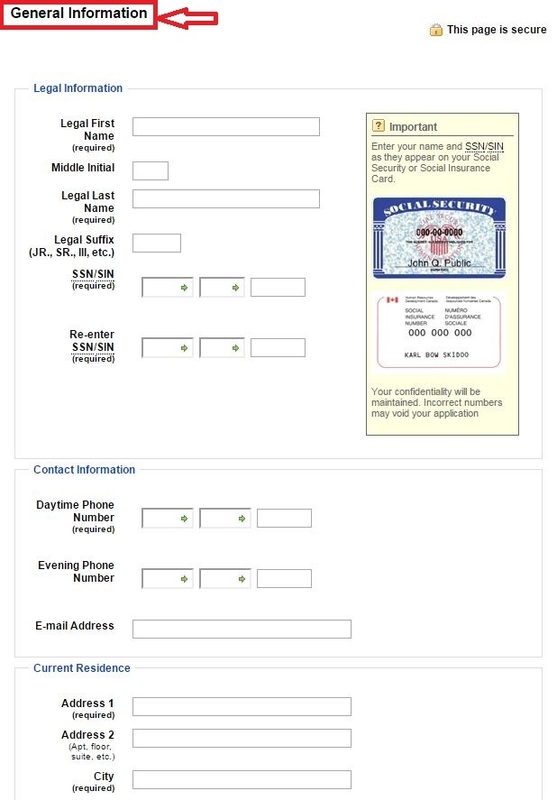 Afterwards, you can start to fill out your general info including your legal info, contact info and current residence. Make sure all the info you provide is accurate so that the recruiters could contact you quickly and directly. Click Next button to move on to the next step. 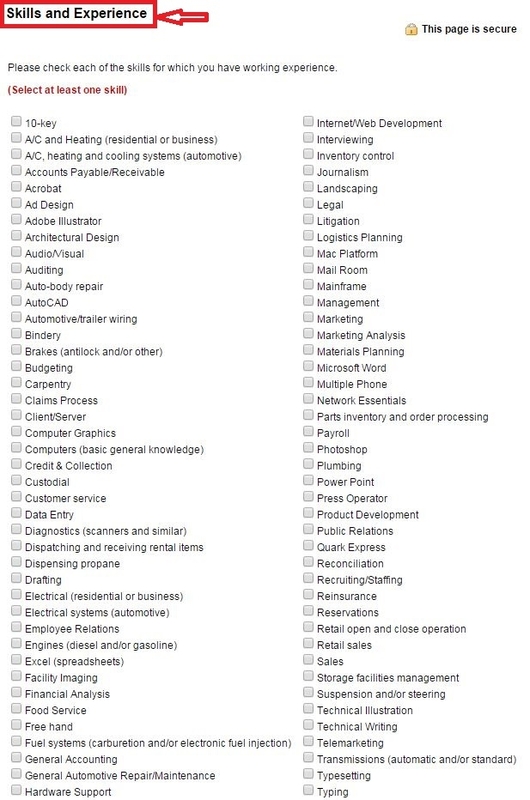 Please check each of the skills for which you have working experience and then fill out your work experience and education history starting with the most recent one. Select which hours or blocks of time you are available for work each day. Times highlighted in green are preferred times for the position being applied for. Fields marked with * are required. After you're done with the availability part, you're asked to answer some questions like "If employed at U-Haul, will you also continue working elsewhere or attending school/college?" "Have you ever been convicted of (or plead guilty or nolo contendere to) a crime? " etc.. 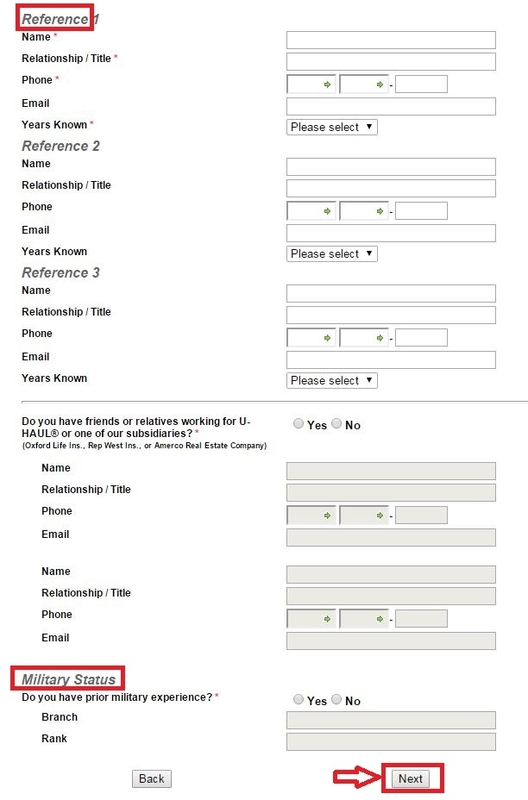 Fill out your reference info like his or her name, relationship with your, his or her phone, email, etc.. Afterwards, select your military status and click Next to move on and then select our gender, ethnicity and referral source. Indicate your consent to the conditions of employment by typing your name in the space provided. This information MUST be entered to complete this application. Re-enter your SNN/SIN number to move on. 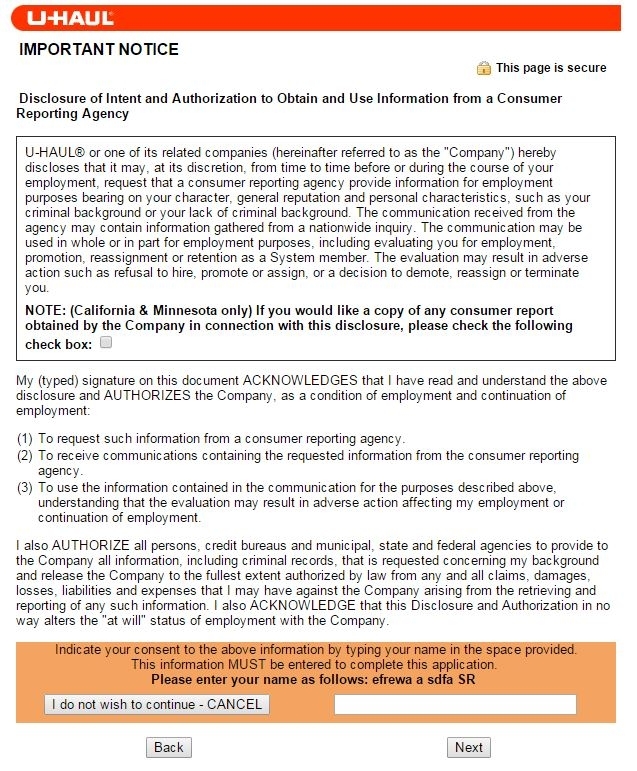 Read Disclosure of Intent and Authorization to Obtain and Use Information from a Consumer Reporting Agency and type your signature to indicate that you've read and understood the above disclosure and AUTHORIZES the Company, as a condition of employment and continuation of employment. 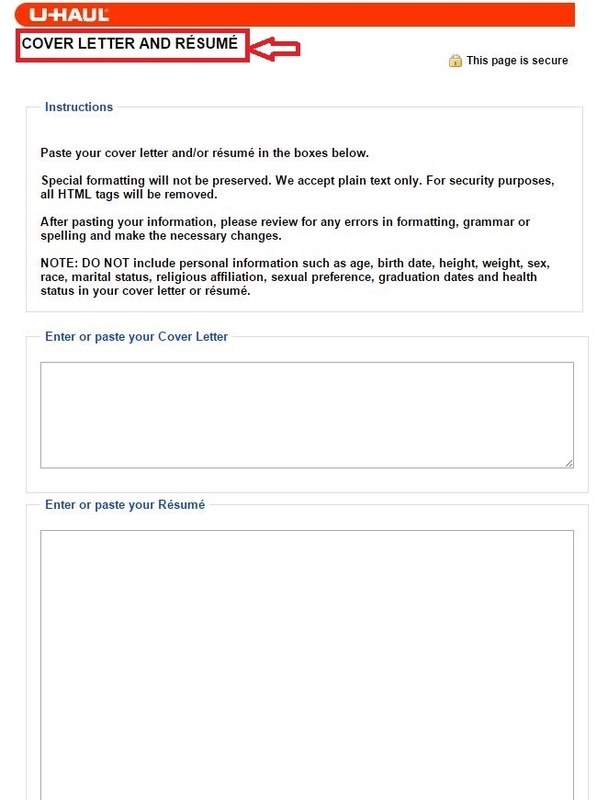 Before you're presented the page below, you need to make response to some questions related to your work ethic after which you'll be asked to submit your application if you're satisfied with the info you've provided. 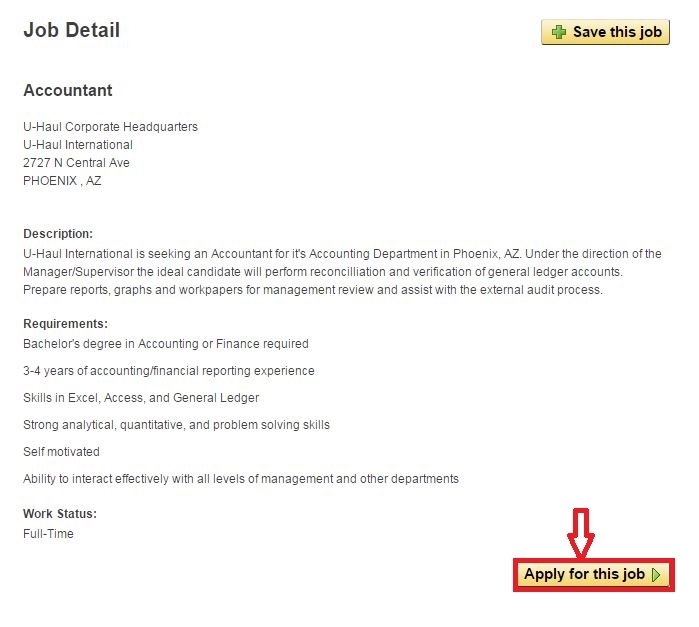 If you are not satisfied with your application, please click the back button to make the necessary changes. NOTE: if you go back to make changes you may need to re-enter some or all of your information. It may take a moment for your application to be saved. 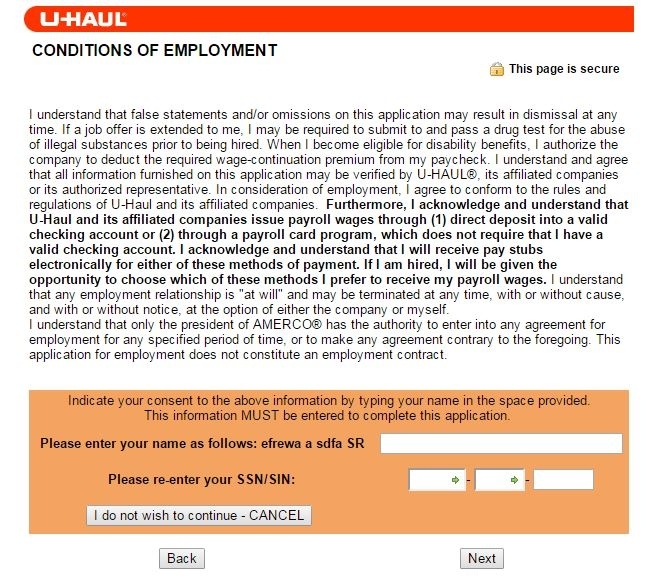 Here comes the end of your U-Haul online application when you see the thank you note which means the recruit team has received your application in response to the company's open position. If they feel your experience and qualifications meet the requirements of the position, someone will contact you regarding an interview. Your application will remain active in the system for 60 days. Click jobs.uhaul.com to apply for U-Haul jobs online.